Australia is a vast and hugely varied country, the scale of which I certainly didn’t appreciate until embarking on a 5-week long road trip down the country’s East Coast. Leaving Cairns at the start of the trip, we first drove north, into the Daintree Rainforest, up to the humid and densely forested shores of Cape Tribulation, before beginning our long journey south down to Melbourne, our final destination. 7000 km, and over 70 hours of driving later, we arrived, our minds full of amazing memories, and our cameras full of spectacular photos. Besides experiencing life in the rainforest, and witnessing the abundance of life and colour found just below the waves on the Great Barrier Reef, we also spent time on the world’s largest sand island, visited many beautiful waterfalls, wandered through Australian bush and eucalyptus forests, relaxed on a beach of the purest white silica sand, hiked to the top of Australia’s tallest mountain, climbed Sydney’s Harbour Bridge – and many other things besides. There really is no end to the activities that you can do, the places you can visit, and the types of environment that you can experience in this amazing country – I certainly felt like I barely scratched the surface! What I describe below are only a few of my memories of some of the most well-known places that we visited along our journey down the East Coast of Australia. It is impossible to do this spectacular country justice in just one short blog – to explore the amazing landscapes and experiences that this country has to offer for yourself, have a look at our paid work and volunteering projects in Australia. Taking a snorkelling day trip out onto the Great Barrier Reef is a must for any visitor to the state of Queensland in Australia’s north east. We chose the small tourist town of Port Douglas as our point of access for the reef, and were not disappointed with our experience of the day. We went with a tour operator which took small groups out to more remote sites on the outer reef, and as a result were able to enjoy the beautiful array of coral and fish away from the crowds – something I would definitely recommend paying a bit extra for! We snorkelled at three different sites throughout the day, and every time we re-entered the water and glimpsed the submarine world beneath, it was hard to believe that what I was looking at was right in front of me and not a photograph – I had to keep telling myself it was real! I particularly enjoyed swimming over a bright patch of coral, full of clown fish, which looked exactly like Nemo’s home at the start of the Disney Pixar film Finding Nemo. The abundance of fish (and turtles), and the huge variety of types of coral, was also hard to believe – it truly was an incredible experience. 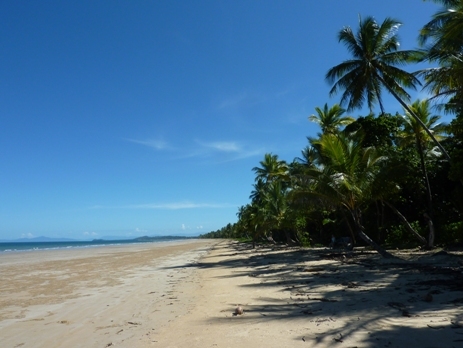 After experiencing the rainforest and the reef, we continued our journey south along Australia’s Queensland coast to Hervey Bay, our gateway point to Fraser Island – the world’s largest sand island stretching over 120 km. The best way of exploring this island is by 4WD, so we joined a small group of 6 others for a tour. It was a busy, but exciting day, with plenty of opportunities for swimming, both in the beautifully blue fresh waters of Lake Mackenzie in the centre of the island, and in the bubbling salt waters of the seaside Champagne Pools. Alongside this, we also experienced several hours of exciting driving over the rough, uneven roads through the dunes, and down along the beach highway, where the road is the sand of the beach itself, and waves frequently spray foam up to the vehicles. At times, it was hard to believe that we were on an island made entirely of sand – it has been there for so long, that vegetation and forests have become well-established, and the scenery and landscape is certainly a lot more varied than what I first expected! Overall, it was another new and very memorable day on the East Coast of Australia. Continuing south through the beautiful beaches of Australian’s Sunshine Coast and Gold Coast, we eventually turned inland to make an overnight visit to the Blue Mountains, before entering Sydney. 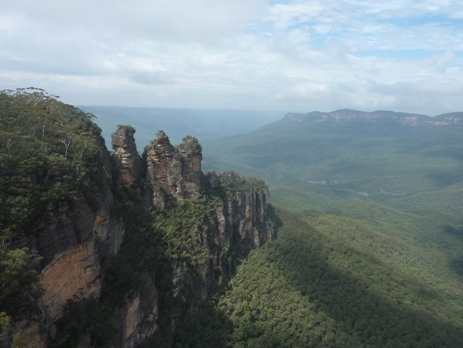 I can honestly say that nothing could have prepared me for the ‘wow’ factor that hit me when I first looked out over the vast tree-lined canyons of the Blue Mountains. With landscapes that some have described as being similar to ‘the Grand Canyon with trees’, it really is hard to explain, or do justice to, the sheer scale of the incredible panorama that stretched out below us. Forests of eucalyptus, with their characteristic blue haze, were interspersed with spectacular waterfalls and rocky outcrops – as with the coral reef earlier in the trip, there were times when I couldn’t quite believe that what I was seeing was real! After enjoying several beautiful walks in the mountains, we headed into Sydney for a few days of sightseeing. 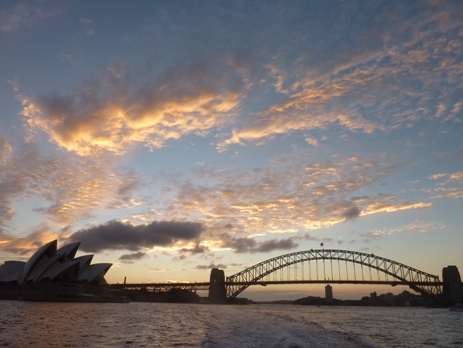 It is safe to say that Australia’s iconic city did not let us down! Our accommodation was in Bondi, one of the city’s coastal suburbs, so we first approached the CBD by ferry – definitely the best way of seeing the harbour! It was a beautiful morning, and as we drew nearer, we had fantastic views of the Opera House and the Harbour Bridge from the water – a great start to our day in the city! And the excitement had only just begun. That afternoon, we were lucky enough to do a climb up the Harbour Bridge itself, and even saw a show inside the Opera House – another memorable day that I will not be forgetting in a hurry. Stretching to the south east of Melbourne for about 250 km along the Australian coast, the Great Ocean Road is heralded as one of the world’s most scenic coastal drives. Coming towards the end of our trip, our two days spent along this spectacular road were our last along the coast itself before heading inland to the Grampian Mountains and back to Melbourne by the inland route. It certainly was an excellent way to end our time on the road! The combination of brilliant weather, dramatic seas, and stunning coastal scenery, made this stretch amongst our favourite of the whole coastline. After spending an afternoon surfing on one of Torquay’s beaches, we spent a night in the lively seaside village of Lorne, before continuing along the coastal road, slowly winding our way alongside the crashing waves, to eventually come to the iconic Twelve Apostles. 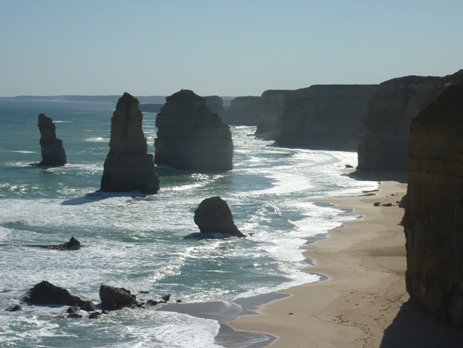 The Apostles are a series of huge limestone stacks rising up from the ocean just off the coast. When we arrived in the mid-afternoon, they were bathed in a yellow-orange glow, making them quite a sight to see – it was hard to stop taking photos, as every corner we turned revealed another view just as spectacular as the last! 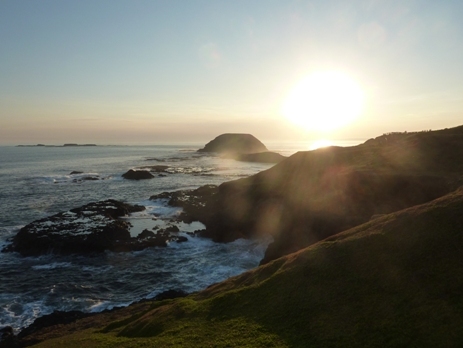 We arrived late that night at our accommodation in Port Fairy, having been unable to stop making scenic detours – but it was definitely worth it! I hope that these brief snippets have left you inspired to visit Australia yourself – the huge variety of stunning landscapes, the friendly people, and the abundance of activities on offer certainly make the long journey worthwhile! If your interest has been sparked, have a look at the range of programmes that we offer in Australia. You could earn money working on a farm in the outback or working in one of Australia’s cities. You could volunteer on a conservation project to help protect Australia’s most threatened environments, or even learn to surf at our Australian surf camp and development course. There are so many exciting opportunities available – what are you waiting for?